Ulan Bator (VNA) – Prime Minister Nguyen Xuan Phuc has met with Speaker of the Parliament of Mongolia Miyegombo Enkhbold as part of his two-day official visit to Mongolia before attending the 11th Asia-Europe Meeting Summit. Speaking at the meeting in Ulan Bator on July 14, both sides expressed their delight at the progress in the Vietnam-Mongolia traditional relations and the close coordination between the two countries’ legislative bodies. The two leaders agreed to intensify cooperation in multiple bilateral issues and at international forums while increasing experience exchange in legislation and supervision. They also plan to adopt a united stance in regional and global issues in the future and boost economic and trade ties to tap the two nations’ full potential. 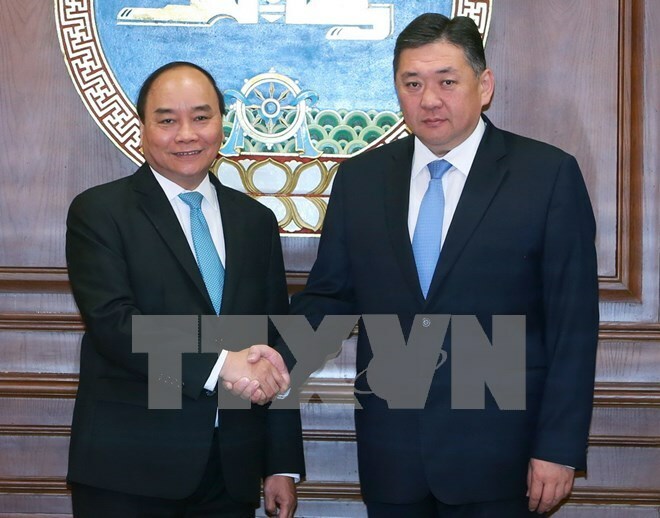 Prime Minister Phuc congratulated Miyegombo Enkhbold on his new election as the parliament speaker and thanked Mongolian people for their valuable support for Vietnam during its struggle for independence in the past. He proposed the two countries maintain the regular exchange of all-level visits to enhance all-round relations. He also conveyed the invitation of National Assembly Chairwoman Nguyen Thi Kim Ngan to Miyegombo Enkhbold to visit Vietnam.